The concept of uncountability is very difficult to understand and use correctly for learners of English. However, even the English sometimes need to count the things which are uncountable. To do this they count the containers the things are commonly packed in or they have a countable expression which is used with the given noun. Thus, they have one pair of trousers, two pieces of cake or a carton of milk. To master this you have to learn the containers by heart. To make it easier I have prepared a short video, a mind map and three games for you. Watch the video and repeat the phrases with the native speaker. 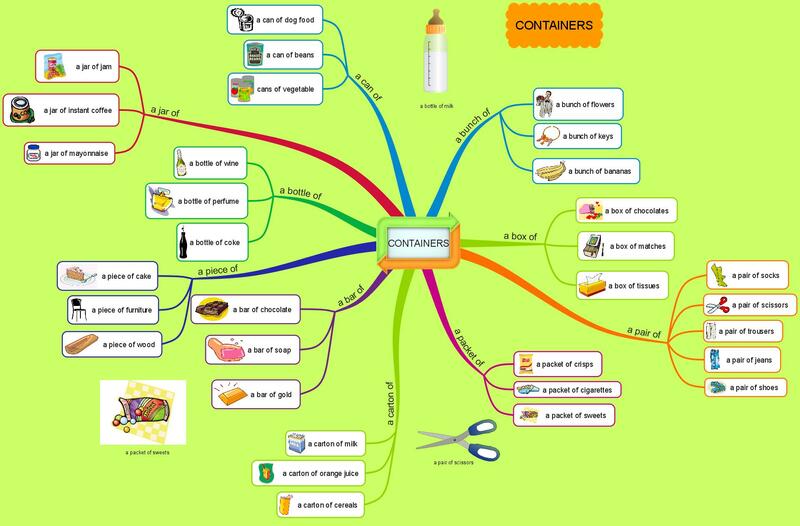 The following mind map visually maps the containers and their usage. Once you have learnt the containers it is time to see whether you really know them. Play the following games and if you win you can be sure that you know the vocabulary. The first game is the easiest one. You have to choose the correct container for the given phrase. If you succeed you will be given the chance to shoot a penalty. Can you score 10 times? No one ever has. BE THE FRIST ONE. The second game is slightly more difficult. Your task is to choose the word which fits into the gap. You have to choose a noun which is commonly used with the given container. If you are successful then you can try to win the fencing duel. Containers – En Garde game. The last game is the most difficult one. While in the previous games it was enough to choose a word, here you have to make it up. And in the meantime the invaders get more and more aggressive. Will you save the planet? Containers – Teacher invaders game. Hi, I loved your lesson. This is a hard subject to teach, especially for Portuguese native speaker. Thank you so much gor your effort! mind map is great to remember easily. we can learn fast through way. I love it. Simply great! Thx a lot for sharing such great work! how can i download the games without using the internet connection ? ?